Like the stars scattered across the void, the Phantoms are the last guttering lights of an ancient, dead world. A decadent nobility bloated on the energies siphoned off their demesne, their appetites grew until it eclipsed any point of sustainability. Entire populations were consumed in their greed. Now, with nothing left to sustain them and their hunger undiminished, the Phantoms must hunt the only prey left - each other. Check back here to discover the Phantoms of Dusk as we reveal them! Hidden within a facade of pale beauty lies a creature from beyond the Void, her outer shell a mockery to the evil and hunger that lies within. Nothing can resist her majesty or fierce power, for she is as hard and unyielding as the stone that surrounds her. The Lord of Bones was once the mighty enforcer of the Faded Monarch. His armor is but a shell, a living reliquary for his remains and the bones of those he consumes. When it is damaged it repairs itself as his flesh once did, and when he conquers he sups the marrow to fuel his neverending onslaught. The Marrow Knight is an implacable foe, constantly advancing and using his dreaded might to feed his armors’ hunger. What is immortality worth when all of your toys are dead? The Lady of Gristle is the pinnacle of evolution, the apex predator who now rules over a land devoid of prey. Can Phantoms bleed? Perhaps she will find an even more delightful ichor coursing through what is left of their veins--or perhaps she will find her own release from the unending night. The First Kingdom has been dead for over a thousand years, yet its monarch refuses to pass into legend with his realm. In his mind, because nothing will ever be as perfect as it once was, he shall rebuild that which is lost to time. His memories morph to fit his perfect narrative and as he cuts away at truth and fabricates lies to justify his quest, he becomes as twisted and warped as his false memories. The Marquis once had the most prized pigs in all the realms, they were as plump and ripe as the man himself. When the famines began and the swine could not survive he refused to give up his excess, so now he finds new, more sinister meats to satisfy his hunger. For most in the fallen realms there are few resources left that are in good supply. The Keeper of fears has had no such famine. With his faithful nightmare companion he stalks the remnants of humanity. When he must, he engages the powerful Phantoms from other realms by devouring them from within. No matter how bad things get he remains, for it is never easy to overcome your fear. Traitor? Collaborator? Great trickster? None know the true motives of the Dancer of the Black Veil. He steps in and out of the Void, cheating death and banishing souls to its empty embrace. With every motion and pirouette he twirls his way to the end, but is it to save us or to entertain the host of darkness beyond? SCULPT TO BE REVEALED SOON! 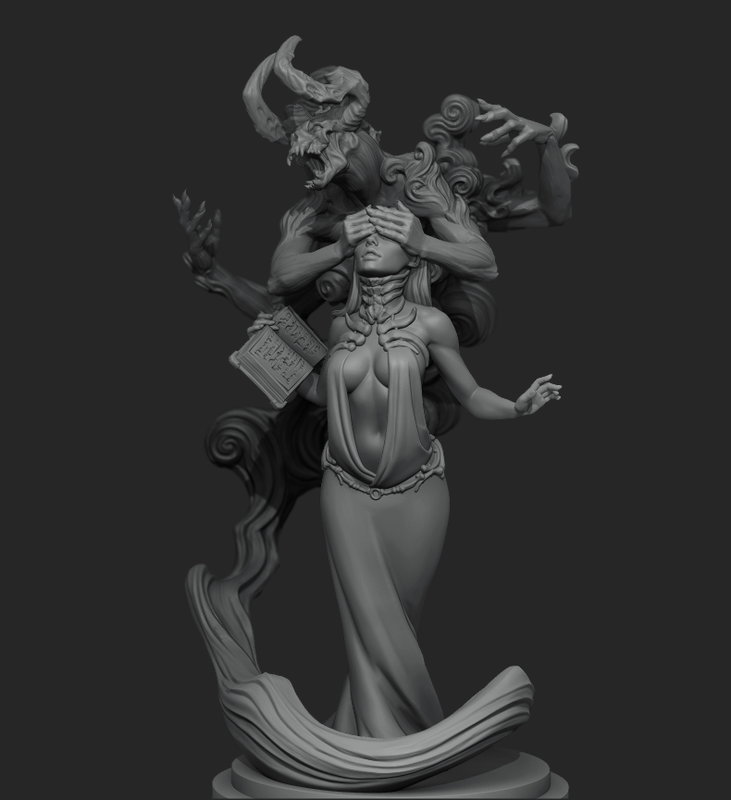 A queen of the fallen fey realms, the mistress delights in sowing discord and chaos. She lives to twist the fates of those she finds. Nothing is certain when in her presence: weapons melt and turn upon their owners, the ground sinks beneath their feet. When you hear the laughter from the woods, run, for in this land the only joy to be had is her delight at her cruel deceptions. Not all of the fearsome champions of the realms are evil. The Unbreakable Maiden is one of the noblest and most powerful who has escaped corruption. When the great famines hit and the lords began to go mad her realm saw in her a shining beacon of hope, and in an act of true selfless benevolence they willingly sacrificed themselves to give her the power she would need to cleanse the dying world. She has been forced to make pacts with the most despicable of creatures in her long quest, but the souls guide and comfort her on her journey. A shield of righteous might, the unbreakable maiden scours the realm for those in need and offers her shield to the last of humanity. WHISPER THIEF - There once was a man that dared to steal from the most deadly creature alive. Silently in the night he crept upon the beast and severed its arm with blades made from moonlight itself. He stole the power of a god as easily as he steals the secrets from the hearts of men. Never caught--and never content--he plays for the ultimate prize, to best the gods at their own game. High in the empty halls of the celestial realms sits the last of an imperial line. She watches her stars blink out, and in the emptiness that once held such beauty she sees only the end of all things. Such a wicked twist that her realm must fade without the adoration of those so far beneath her. Perhaps it is time she remind them the heavens are to be worshiped with awe, for the rain of her fallen stars know no boundaries and know no fear. The Ember was once the spirit of the home and hospitality, a light for the weary to rally around and seek comfort. The loss of so many has stoked his flame into one of rage and destruction. Sometimes the only way to pave the path for a new world is to burn the old one to the ground. 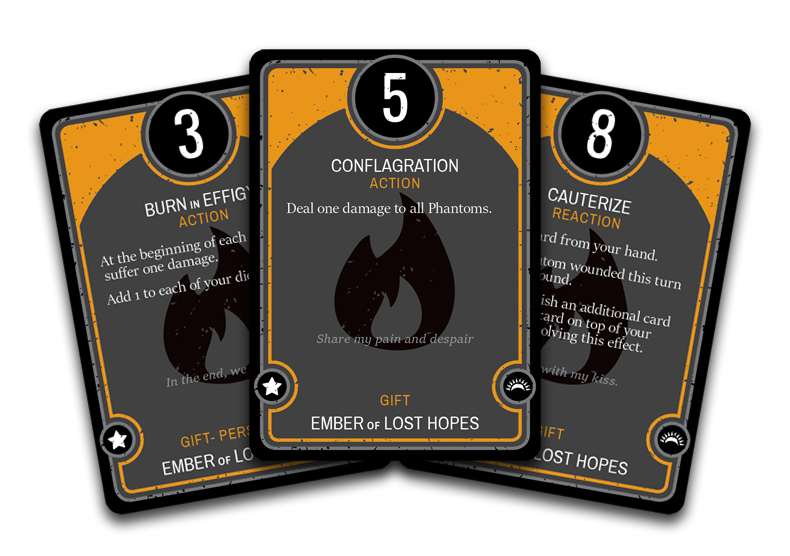 The Ember of Lost Hopes accepts its role to be the kindling for what comes next. The Lady and her death are twin souls in perfect harmony. Through her body the shade reaps the fruit of the dead, and through that shade the Madame reaps the seed of eternal life. Their hunger and reach allow no escape from those unfortunate souls that cross their path, no peace will be had and not even the final embrace can protect you.